The evening air on August 22nd was cooling after the preparations and loading of the 90 carried out during the hot summer day. Lisa arrived home from work at 6pm and we were ready to set off for the port of Dover in the south east of the UK. The familiar pre-trip nerves (have we got everything?) set in as I shifted into 1st and pulled out onto the street. With twin fuel tanks brimming, we were all set to go. Little did I know that you can no longer camp/sleep at ports prior to ferry departure (I used to with my parents in the caravan ~15 years ago) so the subsequent booking of a 4am ferry was soon becoming a reality. The added delay of the closed M27, stop/start traffic on the M25 and ensuing detour all at 9pm ate into our brief sleeping time. We pulled into Maidstone services at midnight, put the roof tent up and tried to get to sleep as soon as possible with the alarms set for 2.30am. As soon as my head hit the pillow, we were up again, it was 2.30am and i felt like i had just closed my eyes. We slept the entire crossing and not getting much distance on French soil decided to pull into an Aire and sleep for a few hours. We ended the day at a campsite just outside Dijon, most of the way to the Alps. The following day saw us rising early taking the motorway to Grenoble where we caught our 1st glimpse of the French Alps ahead of us. Crossing over the Col du Lautaret we decided to head for Briancon. Winding our way up the col to a height of 2058m in glorious sunshine snow and glaciers were clearly visible on the northern faces of the mountains. The views up, down and around the valley were epic. Descending on Briancon we soon realized this imagery before us would be with us for the next two weeks. After a good night sleep in our Maggiolina roof tent we drove into the old town for a look around, Briancon is the 2nd highest City in Europe and has many churches and a cathedral within the fortified old town high on a mountainside. After a quick re-supply we set off to look at a piste northeast of Briancon which looked closed. Rather than risk it we heading down the main road toward the south, we then took another mountain road which traversed the eastside of the valley. An excellent introduction to how alpine pistes would be from now on. The end of the piste brought us back down to the main road which we followed to end our day at Guillestre. With the follow days aim of traversing another piste toward Embrun followed by passing the Col de Parpillion we set off early toward the Col de Vars before coming off the road to take the 1st piste. An excellent drive through alpine forests and across open ski pistes toward the mountain top. As we reached the Col, the sky darkened, a flash of lightning and a clap of thunder immediately followed by a belting hail storm. Straddling both valleys at the crest of the mountain ridge, we had to make a quick decision to turn back or press on. Distances to safe points were equal and the clouds surrounded us showed no openings of hope. I made the decision to press on. We descended down the piste slowly and the rainwater flowed down our path like a river. After 20 minutes or so the rain eased and the piste dried so we picked up the pace toward Embrun. The piste took quite a bit of time to complete as we followed it along its entirety (there are “get out” points to sealed roads along its length) and as such decided to end the day (early) in Embrun. 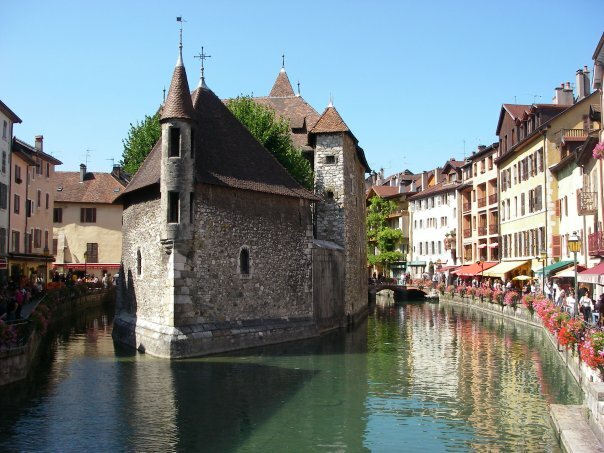 The following morning I woke to some severe backpain which had started during our time in Briancon, but became so bad, even driving into town was agonising. The pain was causing the back of my legs to go numb. All the chiropractors in Embrun were uncontactable due to it not being ski season! therefore the only quick option was a doctor and the elusive tablets. I say elusive because about 6 years ago I had the very same problem, doctors in the UK and tablets were completely uneffective. It was only a 6’4″ Scottish chiropractor who could snap me back into place, hence my reservations of a non-English speaking French Doctor. Anyway, the net result was 40 euros, 3 different tablets for 4 days and no Ibuprofen in sight. Suffice to say, I was a lot better the following morning and with not a moment to spare we headed off to tackle the Col Du Parpaillon. I have to say, prior to this trip, this mountain pass is one I was really looking forward to. 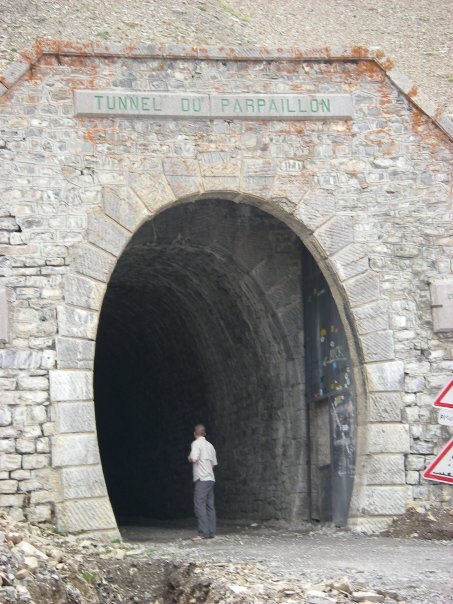 At the crest of the valleys (2640m) there is a purpose made tunnel approximately 0.5Km in length which was built between 1891 and 1901. Make no mistake, the road to (and from) this point is unsurfaced and rough, the tunnel is also unsurfaced and unlit. It is filled with snow most of the year and the sub-zero temperatures cause sheets of ice to form even in August. The huge steel doors at the entrances to the tunnel are testament to the tunnel being closed in years gone past. We drove the Col from west to east driving through Crevoux and into Alpine forests on the dirt road leading into open grasslands. It was here that we started to spot Marmots running along the hillsides, looking for their homes. Deciding to stop for photos an Eagle flew over for a look. I got a few photos but nothing worthy of “Wildlife Photographer of the year”, shame. We cracked on heading for the top, past grazing cows and more Marmots, rounding a corner we were presented with the tunnel. It was time for lunch so we unpacked and made up some sandwiches, in which time 2 vehicles from Luxemburg arrived (110 Puma & 70 series) who after a brief chat showed us some more drivable routes further north which is where we would be toward the end of the trip. We left them to their beers and proceeded into the tunnel. Cold but not so dark with 240w of spotlight shining through, windows down you could feel the icy cold air, it was to much, windows up. A slow drive through savouring the moment. 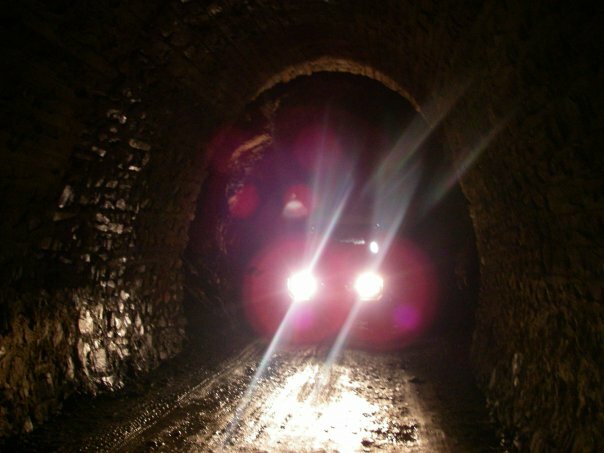 Sections of the tunnel had collapsed in previous years exposing bare bedrock, while groundwater seeped through leaving large puddles on the surface. Before we knew it there was “light at the end of the tunnel” and we were back out onto mountain piste. A narrow twisting passage down the mountain onto sealed roads past Fort Tournoux and onto the mainroad south to Jausiers. 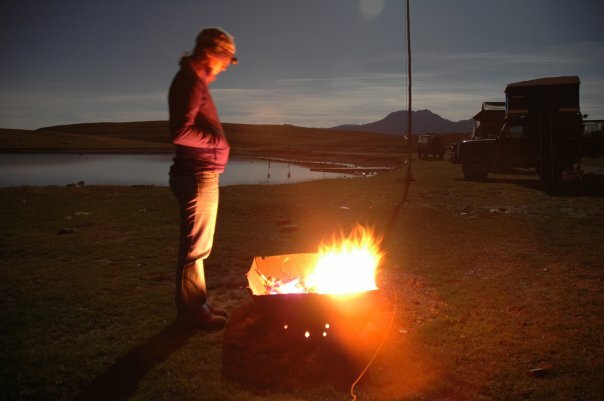 We camped here for the night, bathing in the warm evening sun as we cooked our evening meal. As the days past my back improved, even with the punishing hard-rock surface of the unsealed roads here. We got moving at the usual time and heading southeast for the Col de la Bonette. 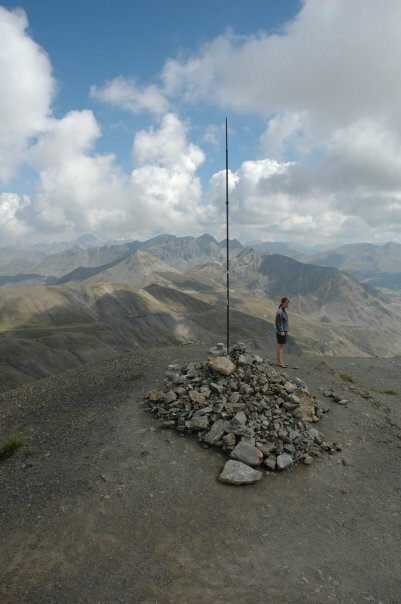 This is the highest (surfaced) mountain pass in Europe at 2802m. It was a long drive up and the final loop to the top was a scary piece of driving. Parked up at the top of the pass we climbed the 60m in elevation to the top of the mountain where we were presented with an epic panoramic view. In true Siroccoverland style it was a brief moment, a few photos and back down the mountain to press on with the journey. From here we took a little known piste south to pick up the Col de la Cayolle (2326m) and then down into Entraunes for a coffee and to let the brakes cool down! The next stage required a bit of decision making as I was not sure where the nearest campsite would be. 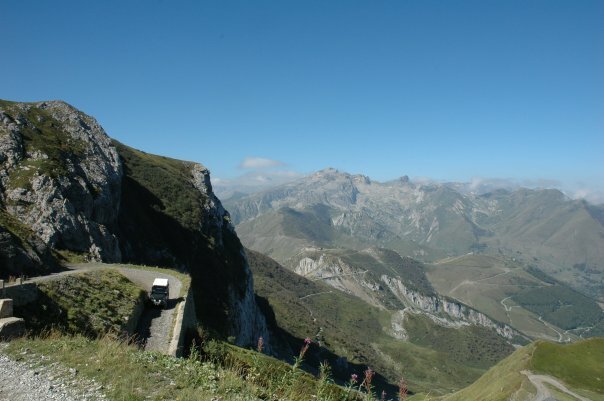 It was decided we would leave the Gorges de Duluis and Gorges du Cians as we did not have time and continue along the “Route de Grand Alps” toward Valberg and Beuil. Neither of these places seemed to have camping grounds so we pressed on deciding on a wild camp off the main road along a piste. It proved to be the best decision as we found a spot tucked away off the piste within a wooded area. Finding a opening we set about making camp as the sun started setting and the forest grew darker. I constructed the fire while Lisa collected some “starter” fire wood. It was not long before we had a fire worthy of boiling the kettle. A quick cup of tea and I went off in search of bigger stuff that would allow our food to simmer in the Dutch oven. Constructing a pot hanger we cooked up a Bolognese over the fire after we had a good bed of embers. Dividing the pit into 2 also allowed me to construct another (fierce) fire to boil the pasta. Whilst out here doing all this I saw something shadow like flick past my peripheral vision on the right. Oww no, my mind went wild with thoughts of budget Hollywood thrillers like Wrong Turn, House of Wax and the like. Axe in hand (it was for chopping wood ok!) I went for a closer look. Stepping out of the tree line provoked another shadowy figure to dart for cover. Luckily for me, it was of the 4 legged kind and was a red deer fawn following its mother. We managed to track these for some distance around our camp getting within 25m at times. It was, unfortunately, to dark for photos. Content with the evenings audio and visual delights; we ate our food, packed up and went to bed. We finished off the piste the next day and proceeded due south where the ambient temperature soon began to rise, yes we were on the south coast, the French Riviera. Heading for Monaco, hoping to find a campsite, we came up blank and got spat out the other side in Menton. Luckily there was a campsite (municipal) there so we parked up there and walked back to the beach for a late afternoon dip. The following day we got on the train in Menton and went into Monaco, it was easier than driving and more relaxed on my part! Being a Sunday it was quiet, with only tourists milling around Casino, the Hotel Paris and the Harbourside. 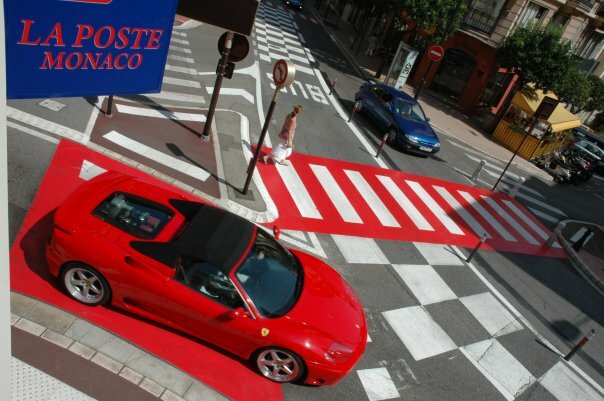 It was almost like all that wealth was staged, and nobody wealthy actually lived in Monaco. We followed the F1 circuit from the harbour along to the famous tunnel and up to the hairpin by Casino, crossing into the parks and wondering the streets. We returned back via the harbourside for a bite to eat and picked up some ice cream on the stroll back to the station. On the train back we decided on a quick dip in the sea followed by dinner in the town. As we had not treated ourselves at all during the trip so far, we went and ate at one of the many restaurants in Menton’s old town, relaxing in the late evening eating shellfish and Dorado. Content with her fill of high living lifestyles and I frankly couldn’t wait to leave, we set off on the following day along the coast to Ventimiglia in Italy. From here we headed north into Liguria, the Italian Alps. winding our way up very narrow roads the scenery was notably different to that of the western (French Alps) we were only, literally, the other side of the mountain range but, fast flowing crystal clear glacial streams gave way to trickles of water and vast impenetrable coniferous forests were now sparse, arid Mediterranean bush and fauna. It was clear quite early on in the day that we were unlikely to finish at a campsite so we looked at the options of a refuge on our chosen piste toward Mount Saccarello. Passing 2 of these (which looks closed/shut down) at around 2pm we decided to press on, we were making good progress and topped Mount Saccarello as the cloud came in making navigation without the GPS almost impossible. A few photos at the top we made a rapid descent back below the cloud and pressed on with our route north. As the evening went on the cloud came back and made for some surreal high altitude driving. 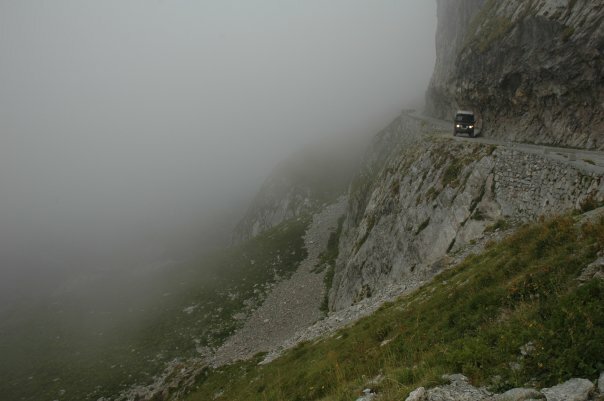 With approximately 50m visibility of the track ahead, the shear drop off the sides was now just a blank wall of cold grey cloud. It was testing times. Stopping a few times for photos and a rest bite we were oblivious to the refuge we were seeking being only 100’s of meters in front of us, just down off the main piste. We arrived at Refuge Barbera at around 5.30pm and went inside for some traditionally strong Italiano espresso… It was well earned and much needed. We decided to eat in with the guys at the refuge and at 7pm prompt the food began. Little did we know, we were in for a 5 course meal! After the 5 separate meals and a generous helping of Peroni Nastro Assuro we paid for 2 beds in the dorm that night. Bright sunshine but bitterly cold we left the refuge heading back west along the piste toward the Col du Tende, the ultimate destination on this stretch of unsealed road. Some hairy driving followed by some even hairier German bikers we arrived at the Fort General and parked up for a look around. We then drove to the very top where an even bigger more fortified gun emplacement stood. After wondering around its impenetrable walls and dry moat, I found a place to climb in through a narrow window. Calling Lisa and helping her up, we were in and exploring each room and walkway of the 3 storey’s. On climbing out we spotted an Eagle as it dropped in for the kill. It isn’t called the “Fortress of the Eagles” for nothing. 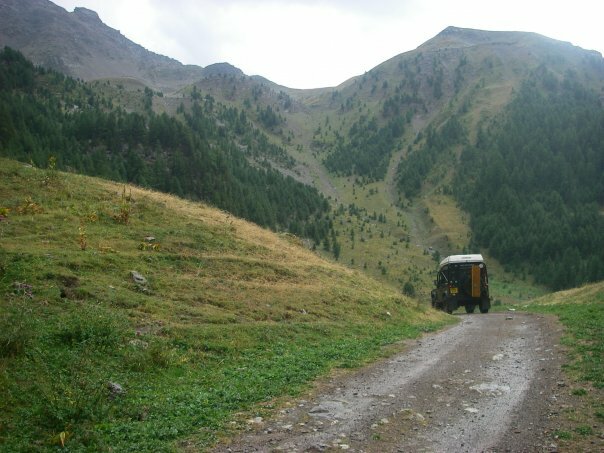 Driving on down to Fort Maguire which is lower in altitude and further west, I went inside for another quick look before departing and starting our descent into Tende. We were now back in France and the descent took longer than expected. I drove over a big green lizard (the 1st we had seen!) on the hairpin descent, pulled over and walked back to see if I missed it, no such luck, It had to be dispatched with a large blade. Tende is a quiet town, we stocked up on fresh food and went in search of the camping municipal. For 6 Euros a night, It was probably one of the best campsites so far, so much so, we stayed 2 nights. After looking around Tende and studying the map, we found what was hailed to be spectacular bronze age rock art in the Vallee Du Merveilles. Setting off early we drove as far as we could before embarking on foot with a climb up towards Mt. Bego and onto the vallee. The rock art was nothing special really, but the walk itself, the wildlife, the scenery and people we met made a great experience. Even if we did walk almost none stop for 9.5 hours! As we descended it was getting dark and we returned to camp for a quick eat and bed. With an epic drive ahead we set off back into Italy through the Tunnel De Tende heading out west through Cuneo and onto the Col de Larche into France. Wanting to follow historically epic Tour de France alpine climbs we headed for the Col de Vars (2109m) and then the Col de Izoard (2360m). Many cyclists (including some Brits we spoke to) make the pilgrimage each year and as it was now September, these would probably be some of the last to cross before winter truly digs in. On top of Izoard there is a Tour de France museum, but sadly it was closed, apparently only open until August. Shame. 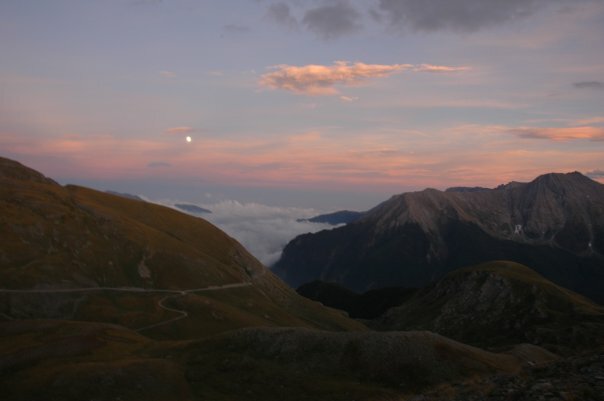 We left the riders and the lunar scenery behind for our return back to Briancon. A brief 30 minute break there before hitting the road back into Italy heading for Sestriere. It was getting late and after a long day on the tarmac I wanted to stop. Driving into Sestriere there were no signs of a campsite, out the other site and the next town was further away and smaller. Would there be a campsite? The only campsite we knew of was Gran Bosco, but that was in the other valley and looking at the map was quite a drive around. As we were there, I decided to scope out the Asseti piste to see if it was open, viable etc etc. All seemed well and after some quick calculations we decided it was quicker to attempt the piste now and drop down to Gran Bosco than drive around. It would also knock another piste off the list and save a day. Off we went up the extremely dusty single track hairpins and across the Colle Basset (2424m). Along the top we were passed by a few motor bikers who were finishing the piste off at the end of the day… We were just getting started! As the sun was setting behind us we heading on East across the Asseti Crest over the Colle Bourget (2299m) and Colle Blegier (2390m) in the hope of taking the track down to Susa. We stopped many times for photos as the evening sun made for some excellent landscape photography. We spotted tracks to a long derelict farmhouse and decided the worst case was a wild camp sheltered behind those structures at 2500m. We travelled on hoping to complete the piste, but it grew ever darker. Passing another old stonewalled hut we caught sight of 3 other overlanders who had made camp. We gave them a wave and pressed on. Meeting at a crossroads with a local, we shared no common language, but managed to convey that there were only 2 ways off the mountain. 1 was the way we had just come; the other was not into Susa but back into the original valley. Disappointing. We turned around and headed back towards the overlanders who turned out to be German and provided a warm welcome along with some local knowledge. 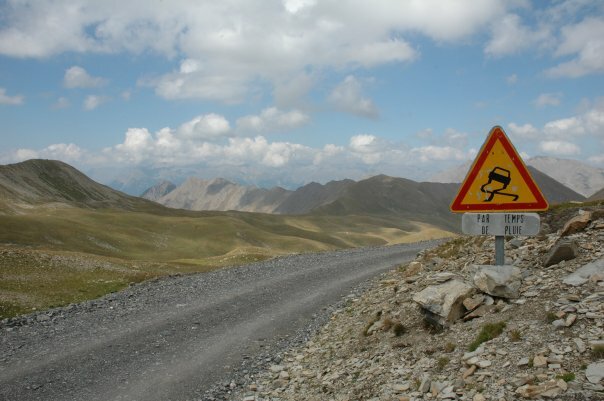 We were soon told the piste to Susa was closed for road works and that they were some of the last vehicles through. 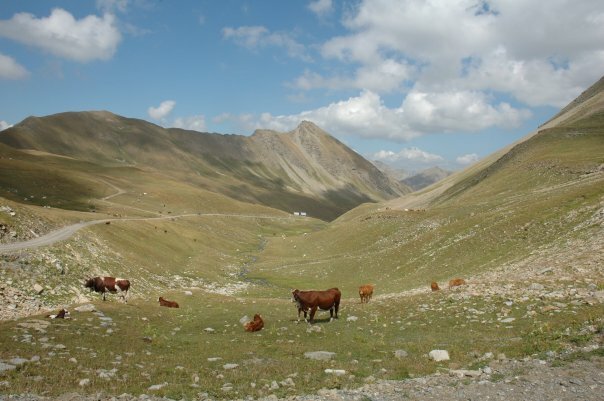 They were on their way to Sestriere but got held up by excavators and groundworks contractors along the route. A quick tin of Stag chilli and rice was on order and we went off to collect what little firewood we could find. 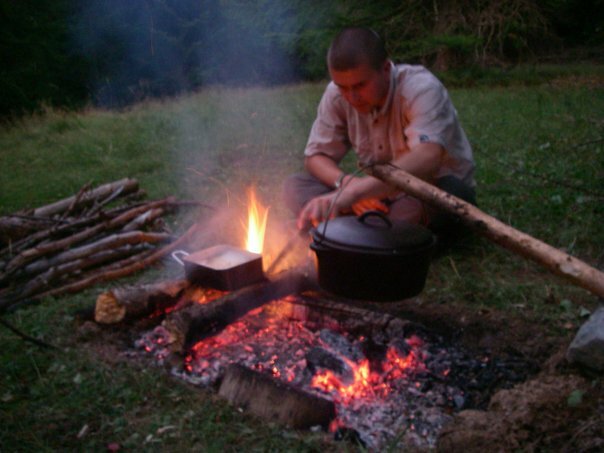 In the cold the stock of wood burnt out rather quick so it was time to head for the roof tent and 3 season sleeping bags. Rather than retrace our steps, the next morning we left the Germans to their coffee and headed on northeast for a look ourselves. We continued along the piste and then took a short road south to pickup the main road back to Sestriere where we stopped in a small café/bar for some espresso and patisseries. Fuelled up we headed north towards Bardonecchia and Mt. Sommelier. 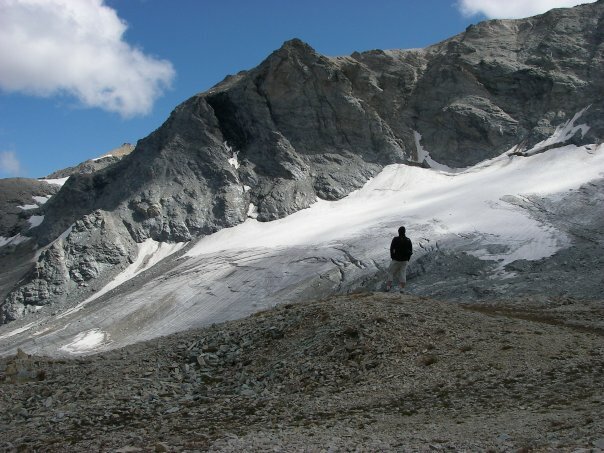 Now the highest accessible point by 4×4 in Europe (after Pica de Veulta in Spain which is now closed) at exactly 3000m the road ends at the Italian/French border adjacent to a lake and the Sommelier Glacier. We arrived in Barbonechette to stock up on supplies and were soon heading north on a tiny switchback hairpin road toward Sommelier. Once on the piste, we felt at home and stopping at the refuge for some lunch, it seemed nobody was around. After lunch a group of bikers came down off the mountain as we set off again and we soon passed a pair of mountain bikers that had been slowly caught up with and overtaken us. The group of hairpins immediately after the refuge were so tight, we had to shunt the 90 once on nearly everyone of them. There must have been 10 or 12 of these, I lost count, but shunting on a piste this tight on such a gradient requires a lot of concentration. Soon the track opens out into a plateau as you traverse north to yet more hairpins and the final accent on Mt. Sommelier. As one of the highest mountains around it is very windy on top and cold. We put on our windstopper softshell jackets and headed out toward the glacier through some snow. It was an excellent place to be. After a few photos, the exposure was getting a bit much. Lisa headed for the car while I took a few more shots. A refreshing drink and we were on our way again, stopping briefly for a chat with the mountain bikers who were on their way to the top. Back on the tarmac we headed east toward Gran Bosco, but being so early in afternoon decided to skip it and head north/northwest toward Mt Cenis and our final destination of the holiday, Annecy. 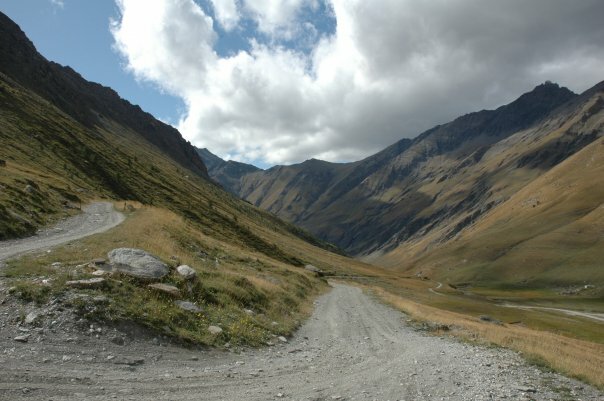 Now back in France we took the old road (gravel) around the west of Lac Cenis which was uneventful and dropped down into Lanslevillard where we spent the night. Quickly crossing the Col de l Iseran ( the only snowcapped Col encountered) we dropped into Val-d’Isere heading north/northwest on the N90 for Moutiers, Albertville and eventually taking the road west around Lake Annecy. We found the camping municipal after getting lost in the city and stuck down a 1 way street which was heading for a multistory carpark at 1.90m high! We spent 3 nights here and thoroughly enjoyed ourselves relaxing by the lake and in the town. Hiring a boat and a tandem we made the most of what little time we had left in this beautifully mountainous region of Europe. On Tuesday September the 8thwe left Annecy early picking up the motorway back north covering a few hundred miles and ending the day near Arras. Covering the remaining 100 or so miles to Calais we stopped at Calais wines to stock up on a few bits before heading for the port. Promptly back in the UK we made our way toward Bristol, stopping in the services for a break. 5 minutes back down the M4 wobble wobble wobble… No, propshaft, has to be the propshaft. I blew a UJ 12 months back probably due to the suspension lift causing the increase in angle on the prop. I had a spare prop just incase (talk of paranoid). Pulled over, got everything out, set about pulling the prop off. 20 minutes later I had 1 end off but the UJ’s seemed fine. How odd. Crawled out and after 30 seconds looking at other bits found all 5 wheel nuts loose on the front offside. Moral of the story? Check everything before taking stuff apart! We drove into Bath and finished the day off with some of Lisa’s friends and a few beers just as darkness fell.